In this tutorial we will explain how to troubleshoot error message ” There was a problem sending the command to the program “. The error appears on office programs like excel or word. The error message is shown each time you try to open the file. The error message is shown only once and you’ll be able to open the file in second attempt. Troubleshooting ” There was a problem sending the command to the program “. When you try to open a Microsoft Office file such as a Word document, Excel spreadsheet, etc, you receive following error messages: ” There was a problem sending the command to the program “. According to Microsoft KB article, this problem occurs due to Dynamic Data Exchange (DDE) feature. DDE is a type of communication protocols which is used by Windows to open certain filetypes which require this protocol for communication between source and target programs. The above mentioned error message appears when Windows sends DDE command to MS Office application but Windows fails to connect with the application, thus it shows the error message in return. Method 1 – Ignore DDE. This problem may occur if the Ignore other applications that use Dynamic Data Exchange (DDE) check box in Excel options is selected. 1. Open the Microsoft Office program and open its Options window. Click on Office ORB or FILE menu present in the ribbon and then click on Options. 2. Go to Advanced tab and scroll down to bottom. 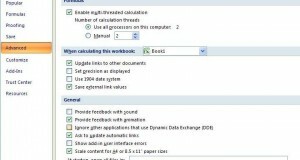 You’ll find “Ignore other applications that use Dynamic Data Exchange (DDE)” option present in General section. 3. Disable it by unchecking the check-box. 4. Apply changes and restart Office program. It should fix the problem. If you select the “Ignore” option, Excel ignores DDE messages that are sent to it by other programs. Therefore, the DDE message that is sent to Excel by Windows Explorer is ignored, and Excel does not open the workbook that you double-clicked. Method 2: Run As Administrator. Open Start Menu or Start Screen and look for the Office program shortcut which is causing this problem such as Word, Excel, etc. Right-click on it and select Properties option. Go to Compatibility tab and uncheck/disable all given options specially “Run this program as administrator“. Apply changes and it should solve the problem. Method 3 : Repair Office. Open Control Panel and click on Programs and Features icon. Now click on Microsoft Office entry present in the list and click on “Change” button. Now select “Repair” option and click on “Continue” button. More solutions to fix error ” There was a problem sending the command to the program “.